The Front Bottoms early releases are arguably brilliant, but unquestionably flawed. Brian Sella had yet to find his signature yelp, the production was lo-fi, the band was still mainly a two-piece, and there was plenty of casual misogyny scattered through the lyrics. The band’s release of the Rose EP in 2014 was a chance to right some of these wrongs: flesh out some songs for a full band, and make them sound like The Front Bottoms had on Talon of Hawk. Ann serves as a continuation of the “Grandma” EP series; the band’s current iteration reworks some old songs to make them more fitting with the Going Grey era of The Front Bottoms, a bad idea on paper that pays off nicely. What’s most interesting about the songs on Ann is how much they sound like they originally did. The production is beefier, and the production resembles that of Going Grey, but the songs feel less tweaked than on Rose. This may be something of a reaction to criticism of Going Grey[i], or it could be the band growing as songwriters and seeing what they captured in youth. The upside to these new arrangements is they put a spring in the songs. “Pale Beneath the Tan” is a perfect example. At every Front Bottoms show, people can be heard screaming “Squeeze” from the audience. It’s probably a request the band are used to but should be tired of. When performed on Ann, it sounds like it’s performed with excellent spite from Brian Sella. He’s doing the dance, but it sounds like he’s actually just releasing all the frustration of hearing people scream for the song at every show. “Lonely Eye” sounds cleaner, but the stray piano in the verses sounds drunker, which is perfect for a Front Bottoms songs. The largest change comes in “I Think Your Nose is Bleeding” where Sella changes a few lines up to clean the song of some of the sexism that it had. “Somebody Else” and “Today Is Not Real” resemble some of the better songs on Going Grey, and they’re fine listens, but they don’t stand out as much as the previous three songs since they were more obscure early work from the band. They fit in Going Grey, but seeing as that was a relatively lackluster album, that may not be the greatest compliment. That being said, the brand new “Tie-Dyed Dragon” is sure to go down as a classic Front Bottoms song. It’s the sort of bizarre storytelling with singable phrases that releases like Talon of Hawk or Needy When I’m Needy are built on. It’s hilarious to hear “I was on LSD when I saved that family” only to be lead to an emotional breakdown when Sella sings, “Once something dies, that’s it. It’s dead. I gotta let it be.” A suiting album closer, and it stirs up emotions and lets them go in its short runtime. 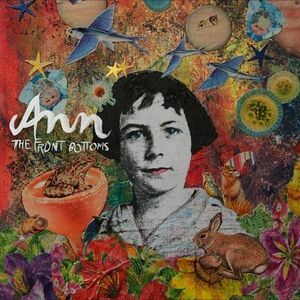 Ann could be a step in the right direction for The Front Bottoms. It looks towards new sounds that they’ve been building towards without losing the original ferocity of their early releases. It may also be a poor choice if this is the death of The Front Bottoms very early material. Regardless, maybe we can just squeeze their arms a little tighter to get what we want. [i] Although, this is probably not the case, seeing as they’re going on a tour playing Ann, Rose, and Going Grey in full.